An engaged couple walks holding hands below the iconic Venice sign stretching across Windward Avenue along Pacific Avenue in Venice Beach, California. Surrounded by colorful buildings against a blue sky backdrop, this replica sign is a nod to the original Venice sign installed by the city's founder, Abbot Kinney. The landmark symbol that is the Venice sign provided a perfect photo opportunity to preserve the memory of this couple's visit to Venice Beach. 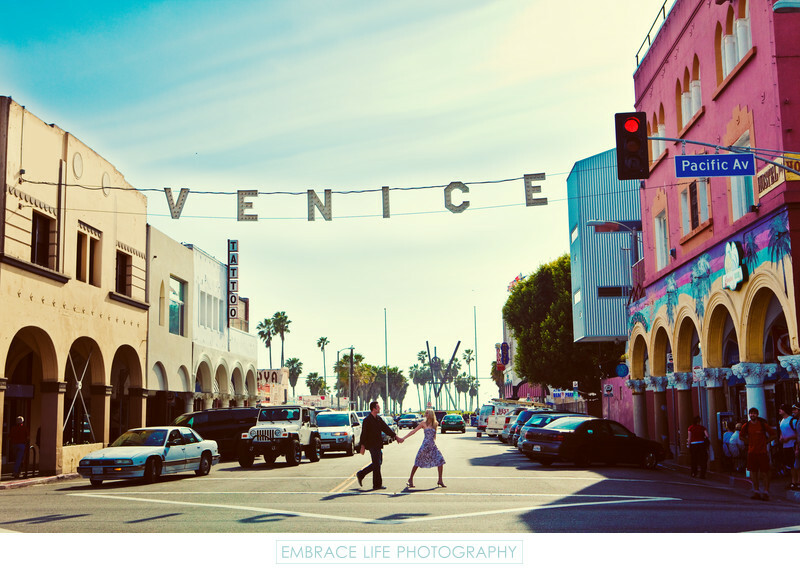 Known for its incredible sandy beach, and colorful characters on the boardwalk, Venice is also home to an interesting mix of classic and modern architecture, some of which can be seen in this Venice sign photograph. The palm trees lining the boardwalk in the distance give make this an iconic California image. Location: 80 Windward Ave. Venice, CA 90291.